Did we mention the voice acting for story mode? Soulcalibur V isn’t a reboot in name, but as we spent hours diving into its intricate system, it sure feels like one. If Soulcalibur III was a largely-forgotten misstep, and Soulcalibur IV was a good sequel for its time, Soulcalibur V marks a solid improvement. It has some questionable moments in its presentation, but overall, it weaves nostalgia together with reinvention for a reasonably sound fighting experience. SC5’s plot takes place 17 years after the events of SC4. Outside of some age-less characters, the biggest impact of this temporal change is a fresh new roster of characters for you to learn and explore. It also gives Project Soul a chance to extract fan favorites from the more forgettable faces of the last two titles. The result is a group of great new characters to dive into (and if you’re playing competitively, dissect and master), and enough familiar ones for lapsed gamers. So if you play Soulcalibur frequently, or you ignored each game since the halcyon days of Link, Spawn, and Heihachi, there’s something here for you. SC5 eschews the numerous guest cameos for a less bloated star roster, featuring Ezio Auditore from the Assassin’s Creed series, and the unlockable Devil Jin, a Soulcalibur-ized version of the Tekken brawler. Both are far more impactful than the likes of the three Star Wars characters of prior games. The benchmark of a solid guest character largely lies in how they play were they not skinned with a familiar face. Ezio’s attacks feel effective and strong, and he’s just as accessible and fun as long-time favorites like Mitsurugi and Maxi. When souls burn, does it smell? If you’re not sure about sampling the youthful roster, SC5’s story mode eases you into trying them out. Over the span of 20 chapters, you’ll play as Patroklos, son of Sophitia, as he battles his way through numerous characters and combatants to reach his long-lost sister Pyrrha. Things are, of course, never as simple as they initially appear, and the lingering effects of Soul Edge still cast over the land. The malfested are still spreading evil, and Pyrrha has been exploited by Tira, who is grooming her to wield the evil blade. It’s all a fantastic excuse to let you test out Patroklos, Pyrrha, and other new fighters, including the spirit animal-channeling Z.W.E.I. (and there are more combatants who evoke classic characters). You will, however, endure some downright groan-worthy moments in its cheesy motion comics. It’s bad to the point of endearing, but then, how heavily does credibility play a role in a game featuring people battling in these outfits? By the time it’s done, you’ll feel rather comfortable with the two siblings’ style, and arguably more than you would simply grinding through Arcade mode. Aside from Story mode, look for Arcade and Legendary Souls modes to help you earn XP to unlock more stages and characters. They won’t come easily for casual players, though. 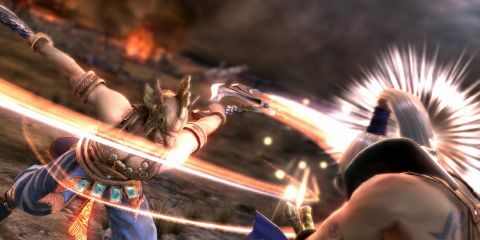 Without some time invested in SC5’s nuanced defensive system, you’ll be re-fighting Nightmare quite a bit in Arcade mode. Legendary Souls is not for the faint of heart. It’s a mode designed for you to brawl through on Very Hard difficulty. For the completist, you’ll need to clear the mode to unlock certain characters. Buckle up.